A fire at the Unilever ice cream plant in Covington, TN, forced employees to evacuate. There was a fire Tuesday at the Unilever ice cream plant in Covington, TN, that forced multiple fire departments to respond, officials said. 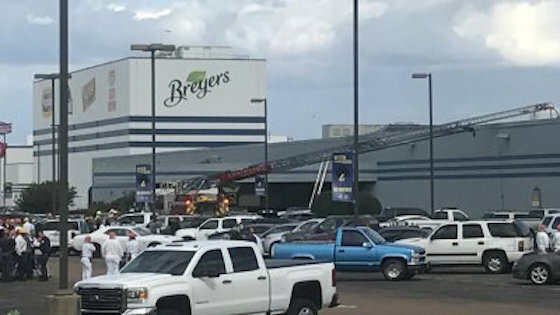 As part of the company’s safety plan, employees evacuated from the plant Tuesday afternoon and no one suffered an injury. There was concern about flammable chemicals at the plant, but they did not catch fire. An air handling unit on the roof did catch fire, spreading to roofing materials. But fire crews from several surrounding communities had the fire under control in a little more than an hour. The Covington plant was billed as the world’s largest ice cream plant. Unilever expanded its Covington plant in 2013 and added 428 jobs over a four-year time frame. As a part of the expansion, the invest $110 million in the facility. The plant specializes in the production of ice cream and frozen novelty items for brands such as Breyers, Fruttare, Good Humor, Klondike and Popsicle.